The day was misty and muggy, as the Gearhart, Oregon coastal haze clouded the golf course and blocked the sun. Still 30 degrees cooler than Portland, it was a great weekend haven from the heat. Portland was setting a record for the number of days over 90 Fº in a row. While watering our vegetables, the sound of a hummingbird wings flew close by. 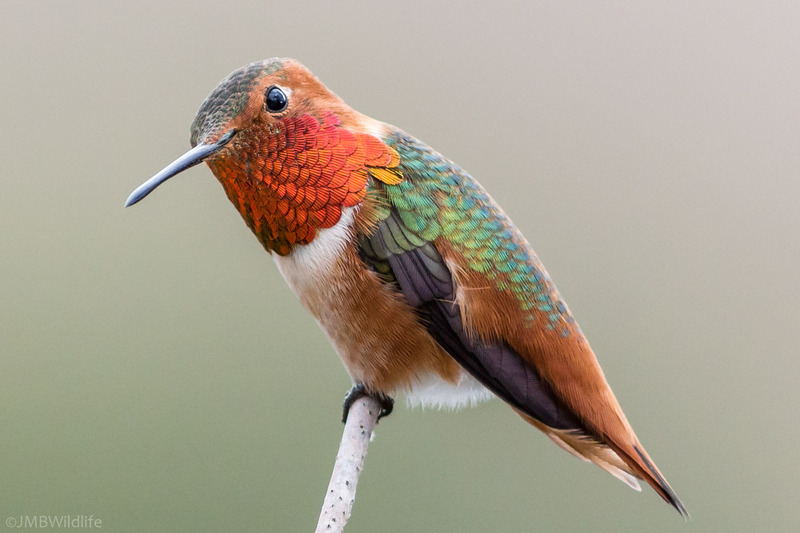 With its reddish feathers and iridescence, it appeared to be either an Allen’s or Rufous Hummingbird. I would soon figure out which one it was. Back to the trusty bird book, I checked the geographical ranges and confirmed it was a rufous hummingbird (Selasphorus rufus or S. rufus for short). 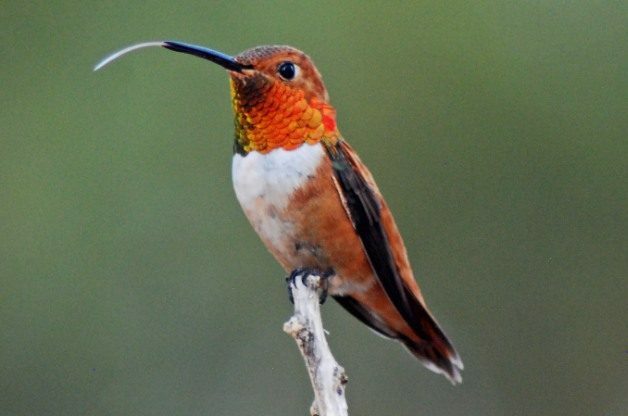 The S. rufus is a small hummer, about 3.1” long, with a long, straight and slender bill. These small birds are known among migratory species for their extraordinary flight skills: from feeding grounds to winter area, to breeding homes, they fly over 2,000 mi (3,200 km) during their migratory transits — traveling from Alaska to the Pacific Northwest and California before wintering in Mexico. It makes me tired just thinking about it. 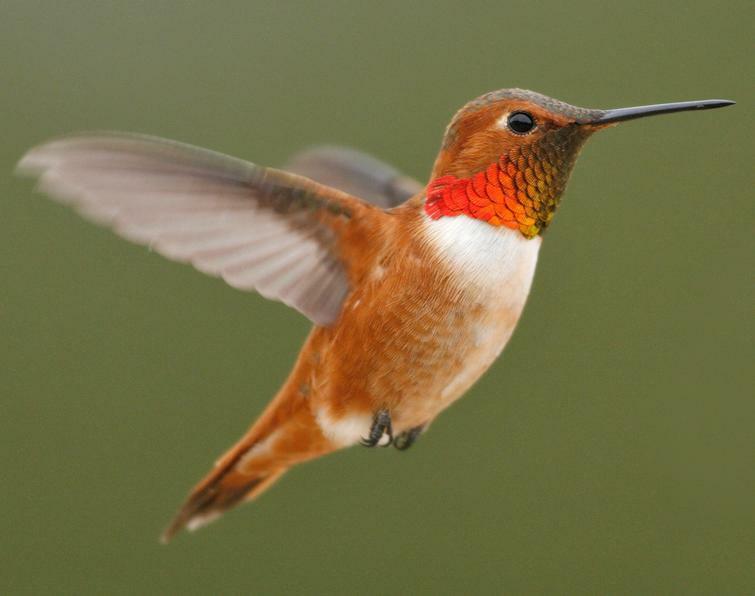 Just imagine this distance traveled by an adult hummingbird that weighs a mere three to four grams. The adult male has a white breast, reddish face, flanks and tail. It also has an amazing iridescent orange-red throat patch or gorget, which appeared dull in the foggy conditions. Some males have green splotches on his back and/or crown. Males generally have shorter wings than females, which means that they must flap their wings faster than their mates. The ornithologists call this a higher metabolic cost for hovering. This hovering rate costs lots of energy, but it has some advantages: it allows males to beat their wings at high frequencies, giving them the ability to chase and attack other birds to defend their territory. The male S. rufus is among the “disloyal to your mate” crew. While the female is carefully building or repairing the nest for the upcoming egg arrival, the male is promiscuously out and about mating with several females in one area. So much for monogamy. The female is slightly larger than the male with longer wing spans. She has green, white, and some iridescent orange feathers in the center of her throat. 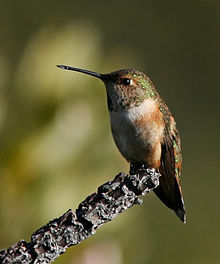 She has a dark tail with white tips and rufous base. Since birder’s pride themselves on quick identification of bird species, I was relieved to read that the females and the rare green-backed males are extremely difficult to differentiate from the Allen’s Hummingbird. Both male and female S. rufus are territorial, but they defend different types of territories. The more aggressive males fight to defend areas with dense flowers, pushing females into areas with more sparsely populated flowers.